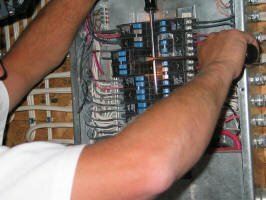 Replace a breaker in your panel safely and easily by following the step-by-step instructions and pictures provided in this article, and learn the important role of circuit breakers. 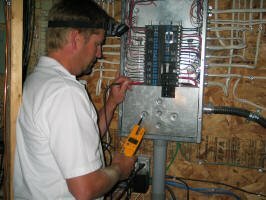 Do-it-yourselfers can safely replace a breaker in their panel if they follow the proper safety precautions. However, let me first explain what the function of a circuit breaker is. 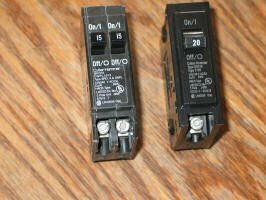 A breaker is designed to protect your wires from carrying too much current, and to trip off on an overload or a short circuit. That is why proper sizing of breakers is so important (i.e. #14AWG wire on a 15 Amp breaker, #12AWG on a 20 Amp breaker, etc.). This is all spelled out in the CEC and NEC. Never oversize a breaker to solve a tripping breaker problem! 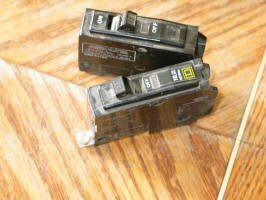 The first question to ask yourself is – Why am I replacing this breaker? If you are adding a circuit, and now need to install the breaker, then this of course is necessary. 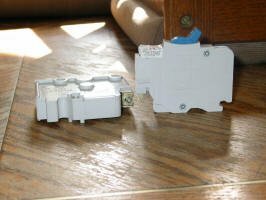 The situation that I run into a lot is people wanting to replace a breaker because they think that it is faulty, or has failed, or trips off too often. 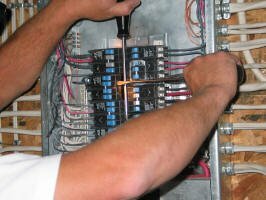 Not that breakers don’t sometimes fail, but more often than not, the breaker is just doing what it’s supposed to do, and the problem causing the breaker to trip needs to be rectified first. Unplug any devices that are on this affected circuit, shut off all lights, and then see if the breaker will reset. If it resets with all known loads disconnected, then you can start re-connecting devices one by one, and/or turn on lights to determine where the problem is. Turn off the breaker before plugging the item back in, and then reset, because if you have a short circuit in a device you can get a high inrush of current that can arc severely, possibly burning you or worse. When a short circuit has occurred, an extremely high amount of current can flow before the breaker trips. 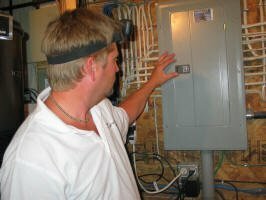 If the breaker won’t reset, and doesn’t put out voltage on the load terminal (use a reliable voltage tester or a volt meter to check), even when all known loads are disconnected, then you probably have a faulty breaker, and it needs to be replaced. You will need to get all the information that you can (brand name, part numbers, breaker size, breaker type, etc.) so that you can get the proper replacement from your supplier of choice. 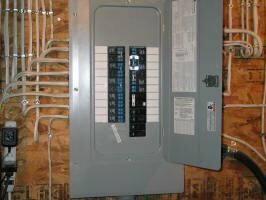 Most homes will have a combination panel, with a main breaker, and then all the branch circuit breakers below. Take note that even after taking off the panel cover, you don’t have access to the main breaker compartment without removing the main compartment cover as well. Don’t open this cover. If you have a problem with the main breaker, you will need to call in a qualified electrician for this. In any case, arrange for some back up lighting beforehand, either with a reliable battery operated flashlight or lantern, or a portable generator with a trouble light, or lamp, etc. In our example, let’s assume that you have an ordinary combination panel, with a 100 Amp 2-pole main breaker, and then a branch circuit compartment. We’ll use a Cutler Hammer, CPM 120 Panel. 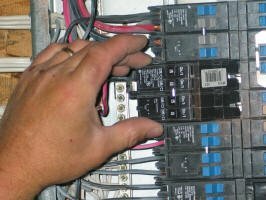 Before shutting off the main breaker, shut off all branch circuit breakers first. It is always best to remove the load from a breaker before shutting it off. With the main breaker off, the buss bars that the branch circuit breakers connect to are isolated from the incoming voltage and will be safe to work on. Never just assume that the breaker has shut off properly – check for voltage on any adjacent two breakers to assure that the panel is dead. 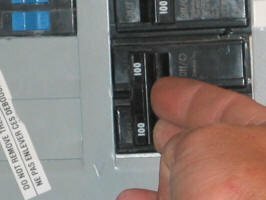 Most homes will have ‘push in’ or ‘stab in’ type of breakers. In some cases, usually in commercial applications, the breakers bolt into place on the buss bars. 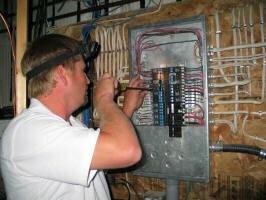 Start by disconnecting the wire from the load terminal of the breaker and pull the wire out of the way to facilitate removal of the breaker. Carefully pry the defective breaker out of its position as shown here. 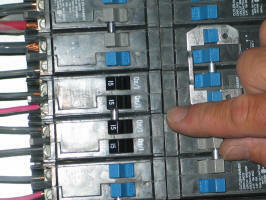 Take note as to how the breaker locks into position in the panel. In the case of Cutler Hammer (formerly Westinghouse, Nova Line, etc.) the back of the breaker pushes back into a mounting strip first, and then pushes onto the buss bar. Re-insert the new breaker and push firmly into position. Then re-attach the wire to the load terminal. While you have the branch circuit compartment open, inspect for any other potential problems, like loose terminals, and it is a good idea to re-tighten all connections while you’re in there. 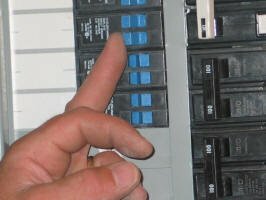 Now you put the panel cover back on, and if you have installed a breaker for a new circuit in a new position, you will have to remove the appropriate breaker knock-out from the panel cover. 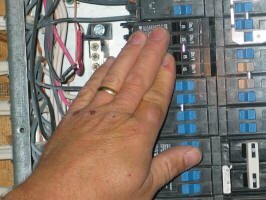 After the cover is back on, it’s a good idea to shut off all of the branch circuit breakers, then turn on the main breaker, and then one-by-one turn on all of the individual breakers. Then check and test everything to see that all systems are normal. 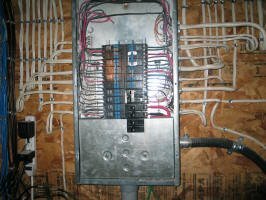 This entry was posted in Circuit Panel and tagged bolt in, branch circuit, breaker, buss bar, circuit breaker, circuits, Cutler Hammer, disconnect switch, diy, DIY wiring, do-it-yourself wiring, electrical panel, Federal Pioneer, home electrical, home electrical wiring, home wiring, how to replace a circuit breaker, Nova Line, panel, power, replace a circuit breaker in your panel, Square D, Stab in, tripped breaker, voltage tester, Westinghouse. Bookmark the permalink.